GEORGE F. EVENS, MANAGING DIRECTOR brings over 35 years of successful senior management/executive committee experience with many major chains, to this position. 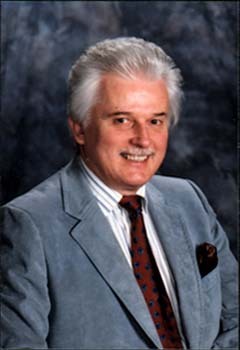 As well, concurrently since 1982 he has been owner/operator of several family owned businesses, including Management/Human Resource/Labor Relations Consulting, Office Cleaning Business; since 1987 Chair of The Council Advocacy, submitting commentary to Business & Government on a host of topical issues from the Economy, Law Reforms, Labor/Management/Employment Standard reforms, Ethics & Civil advocacy; since 1995 Managing Director, The Council Animal Advocacy (CLAW). Recognized as the consummate professional, he is approachable, has an easy going informal management style, may be rivaled in his dedication, sincerity and commitment but never surpassed, possesses a herculean energy, strong organizational skills, an ardent communicator and persistent; performs to a high standard of excellence, integrity, ethics, “makes things happen” via a proactive, progressive and positive approach; sometimes known for his “devils advocate” approach. A compassionate person, sometimes his passion that emanates from a conscience & compassion for causes displays an intolerance for the indifferent, apathetic and moribund leaders whom he has little patience for. Our decision to commence dedicating our lives to improving the lives of Animals was first focused by my wife Claudia and while an inspiration always the motivating drive came from our beloved companion animal Ling Ling. Being with him daily was a constant reminder of the joy and fulfillment in life that an Animal can bring but as well, had he not been adopted by us it may well be he could have been one of the thousands killed annually by the SPCA or by some predator. We dedicate this site and our continued altruistic efforts on behalf of animals to the memory of Ling Ling. 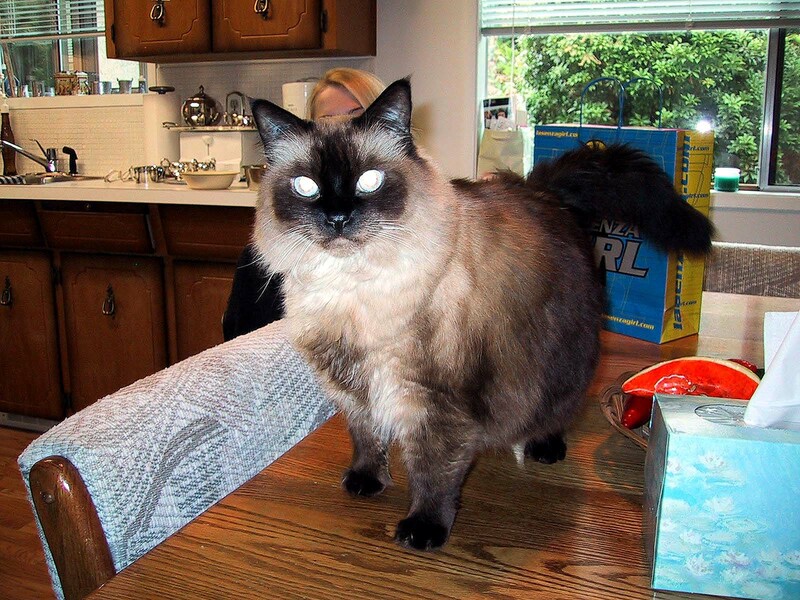 It all started on a blustery cold winter day in February 1996 when a distinctive meow was heard, above the wind, emanating from under my wife’s car. Investigating the forlorn call she found this choc point rag doll trying to keep warm. She brought him in, cleaned and fed him and his inner warmth immediately took over our household and our hearts. Following a lengthy unsuccessful search for his rightful companion animal guardians, and subsequent efforts to find him an adopted home, it soon become evident he was a part of our lives. Ling Ling died Saturday evening July 6, 2002, an unnecessary death, one caused as a result of some “greed inspired” manufacturer whom produced inferior product, a flexible door stopper with a rubber tip placed over the end in such a manner as any animal or child could easily remove and ingest, which in Ling Lings case, it became lodged in his intestine, resulting in irreversible and fatal liver damage. As anyone whom understands the deep bond that can develop between man and animal, how an uncompromising love and respect evolves, will empathize with our deep sense of loss and overwhelming grief we feel. The loss of a companion animal is no different than the grief felt at the loss of a human family member, maybe, as in our case, even greater, particularly when unnecessary and avoidable. While a sad phenomenon exists in the world wherein a certain ilk cannot fathom, nor apparently share their love and respect for animals, instead embracing an unfulfilled, cold heart, thinking wrongfully humans have dominance over animals literally, that too often provides their jaundice rationale for treating animals inhumanely, to inflict pain and suffering and display their disrespect and afford no dignity towards animals and this sad behavior is one of the cornerstone issues of our many causes. Ling Ling brought over 7 years of love and joy into our lives; his knack for finding “treats” that we had so skillfully hidden in with “dog bone treats” and placed in our pantry cupboard shelf, Ling Ling would open the louvered door, climb up on the third shelf, grab the dog bone bag and throw it to the floor with a bang and out would pop the cat treats; to, at times believing he was a dog, each time I would call the dogs to go out, Ling Ling appeared at the front of the pack and when time to come in, he would lead the dogs back to the door; being an indoor cat he only ventured outside with my wife or myself, so on Sunday mornings he would come out for coffee and sit by the patio while we read our papers; During the week he sat in the bathroom while my wife got ready for work and then run back to bed with me til it was time for me to get up. Vacuuming was a game for Ling Ling, while the dogs barked Ling Ling would jump up on the cat stand and wait to be vacuumed. Simply, he was everywhere in our lives and everything to us, his passing has left a deep emotional void in our lives but many wonderful loving memories will keep Ling Ling forever in our minds – even in death he continues as an inspiration to us and motivation to help other animals. Rest in peace Ling Ling and we know if there is a “Cat heaven” you will be there making everyone’s soul happy just as you did with everyone you met. Let Ling Lings death serve as a warning to Companion Animal Guardians and parents alike, refrain from buying these ‘flex door stoppers’, if you have in your home, ‘remove the rubber tips’, contact local Home Improvement Stores to recall, remove from shelves, notify suppliers to refrain from further manufacture, ensure warning labels are placed on product and shelf talkers if they will not remove the offensive product. Indeed, once notified it is seen as continued negligence to sell such inferior product but to those with companion animals or children, act in your best interests now! A reminder, if a Cat does not eat for a couple of days, vomits, reflects a different or lethargic behavior consult a Veterinarian. A liver will use stored fats and easily becomes clogged with fat causing irreversible liver damage and may display jaundice. Immediate blood tests may assist the Veterinarian but in Ling Lings case, even early detection and operation to remove the obstruction, showed some early stages of liver damage. He was treated, force fed and we thought recovery was imminent but suddenly, a relapse after a month which prompted a second operation that we found the liver had continued to deteriorate and the prognosis was fatal; the recommendation being “to let him go” and end suffering – we did! This was the saddest day of our lives and we hope viewers will act swiftly to pet/child proof your home even to the extent of checking door stops. “Celibate appeared at our door one day and decided to adopt us. He was a nieghbours across the ravine at back. We called the neighbour and arranged to drive Celibate home, which was done. However, by the time we got home, Celibate was back at the door, having taken the short-cut across the ravine. A “tough guy” and the only pal we had to take out health insurance on to cover VET bills. He was a very spirited and energetic guy, explored the neighbourhood and stood guard over his home. 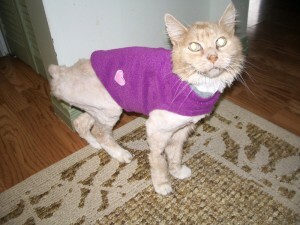 He mellowed a bit in later days, became frail and we bought him a little jacket to keep him warm. In his last days he would come and sit on my chest and sleep the evening away. God Bless you Celibate a friend til the end. While we love & cherish all our (Pets) one always seems to surface as a key figure, such as along the way our quest was inspired by “Ling Ling”, then “Celibate” and now emerged “Bogey” as successor to the crown. Bogey became a regular and daily companion, followed me everywhere, carried on conversations and his leaving has created such a massive void in my life, it is hard to imagine a mere Cat, you say, having such a lasting impact. 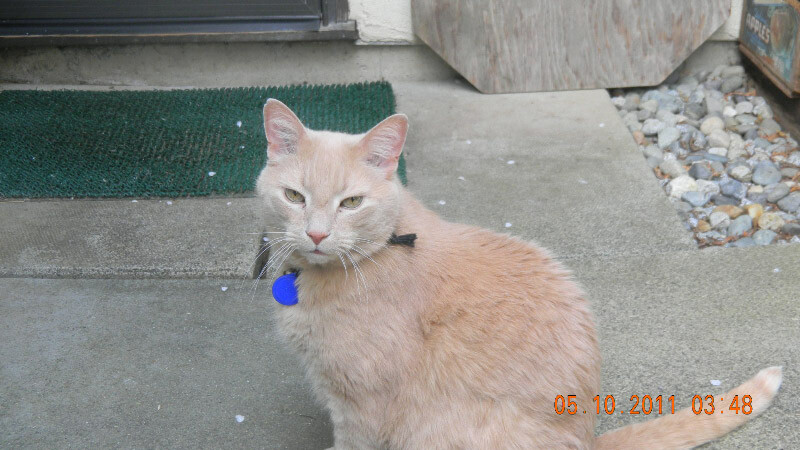 Bogey appeared one day at our home, clinging to the screen door, something he learned to do to get attention. After several visits we put note on a collar asking his Guardian to contact us. One evening a young woman called to say that was her Cat, but no she would not leave a name, phone number and instead I gave her my number and said if she misses the Cat, call me. Well, Bogey repeatedly came back and we never got a call. Now 15 years later Bogey is still here. A short time ago the local Abbotsford NEWS & RECORD papers did a feature on me “The CatFather” and Bogey appeared as my ultra-ego. He would sit at my right shoulder on the back of the chesterfield to keep an eye on things. One evening he growled a warning and looking back over my shoulder was met with a huge Black Bear looking in the window. Bogey would go outside for some air but no matter where he was, when I went to the door and called “Bogey Bogey Bogey”, you would witness a flash of tan fur and in seconds Bogey was at the door . At bed time, I would say, “let’s go to bed Bogey”, he always responded with a meow, jumped to the floor and walked down the hall to the bathroom door to await my arrival, he would sit and wait at the toilet and then came to bed, sleeping beside my leg. In his last days he had to go on Thyroid pills and shortly later seemed to be showing some discomfort, so off to the VET for an exam. He did not seem to respond, had developed a worsening cough and sadly, on my way to retrieve him, the VET called me to inform some sad news, he had taken an X-Ray and Bogey had a large tumor in his lung. He actually went down fast, very worrying cough and complications.. So, with heavy heart but no desire to witness any suffering, we collectively decided euthanasia seemed the right course. I have tears in my eyes as I write this, as Bogey imprinted upon my life and while I cherish his memories and many great times, he is gone and that is very hard to deal with, at best. Spending so much time with our various adopted pals, has given me an insight to their vast intellect and unequivocal love they give only hoping to be loved in return. It has given me resolve to be a staunch ally to the millions of neglected and abused Cats, that sadly, far too many are killed to cover up the huge Guardian neglect and equally indifferent position by elected (Politicians) who could immediately remedy much if not most suffering endured. Bogey is gone but his memory will last forever in my wife and my minds and we are eternally grateful for the time we had together”. 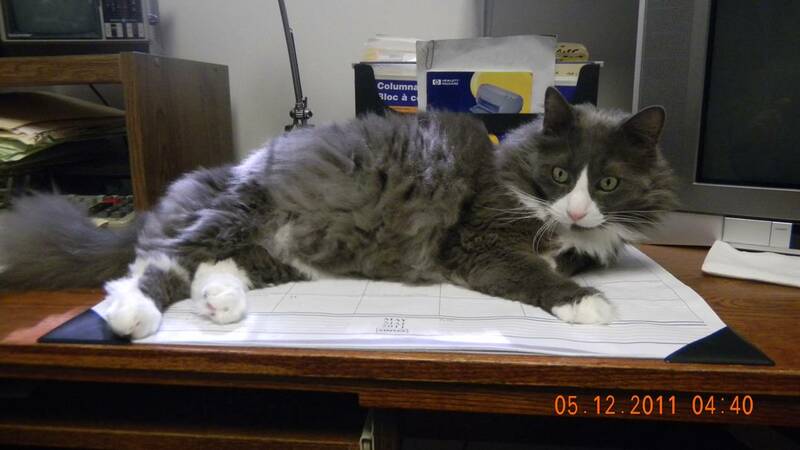 Claudia, my wife arrived home with a large long-haired grey cat she had rescued from a parking lot near her work. After trying to find his Guardian, we decided to adopt our precious “Smoochy”. While sometimes a bad boy, he would “spray” various spots in our home and in some cases ruined flooring and walls. Soon Smoochy & I formed a bond that grew over the years. Smoochy was, as you may appreciate, my “Best Friend”, he was with me every day from getting up in the morning and then would sleep with me every night. While working in my office, he had his own chair but liked best to lay on my desk in front of my terminal screen, often making it difficult to read what was in front of me. Similarly, when at my other desk, he would lie across papers strewn on the desk. Every night I would say, “let’s go to bed Smooch” and he would come to my end of the chesterfield and while I was straightening throw cushions, he would play with the tie of my housecoat. Then, jump off the chesterfield, go down the hallway and stop at the bathroom door, waiting for me to do my bedtime routine. When in bed, Smoochy would come up to my pillow, often touch my face with his paw, then cuddle down beside me to sleep. Smooch undertook to be our “Guard Kitty” as well, upon possibly hearing a noise, he would get out of bed, go to a couple of windows and if he thought something or someone was present, he would start to howl, very loudly. He soon applied to take on most of the duties by my late pal “Bogey” and became a very wonderful and loyal pal and a good worker. Every morning he would come up to my pillow, and I would hold him, give him a hug and kisses, then he would lightly bite my hand, our morning routine I guess. I would say, let’s go for coffee, and he would walk to the kitchen table, jump up beside my place and lie on my newspaper while I drank coffee. So many fond memories that will last forever but Smoochy is very greatly missed and will never be forgotten. Watching TV he always sat a my feet on the chesterfield. I slept on the chesterfield the last few days to be with him at his time of pain and suffering, to help him go to bathroom and comfort him being near. Kidney failure was setting in and by his going blind was a devastating thing. He was sleeping nearly 24 hours daily, drinking water and little food, that diminished quickly, as the onslaught of his illness started and ended within a few days, he went down very quickly. 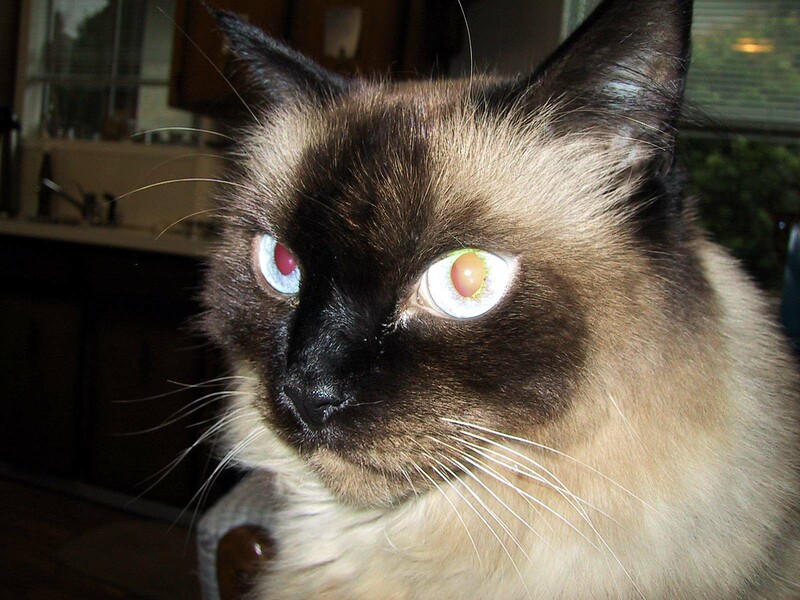 Upon further diagnosis by our compassionate Veterinarian Dr. Vishesh Jalan (VJ) of Clearbrook Animal Hospital, he was indeed blind and apparently starting to suffer, losing bodily function control, so another most horrible day of my life ended by our having to euthanize Smoochy. The emotional loss is immense and the only salvation is to know this ended any suffering but sadly, this does not ease the pain of loss. As any with a loving Companion Animal know, while some dismiss as “only a Cat or Dog” they are in reality “loving members of family” and we display the same compassion and emotions as we do for other family members. I am so saddened, hard to stop crying at this significant loss to my family and daily companion whom I loved most dearly. Smoochy will be remembered always as a faithful companion who gave unequivocal love and enjoyed a good home and love right back at him to the end. Sammy was hanging around our home, sometimes eating bird seed and looking lost. Once we could get him comfortable with us, so we could pick-up and check, he had a tattoo. Upon checking with the Veterinary office we found out where he lived. It was across the ravine nearby, so I took a drive over to talk with the Homeowners. Met with an unkempt yard and upon knocking on the door, was met with Dog barking, children yelling, another Cat and a lady of vast indifference. 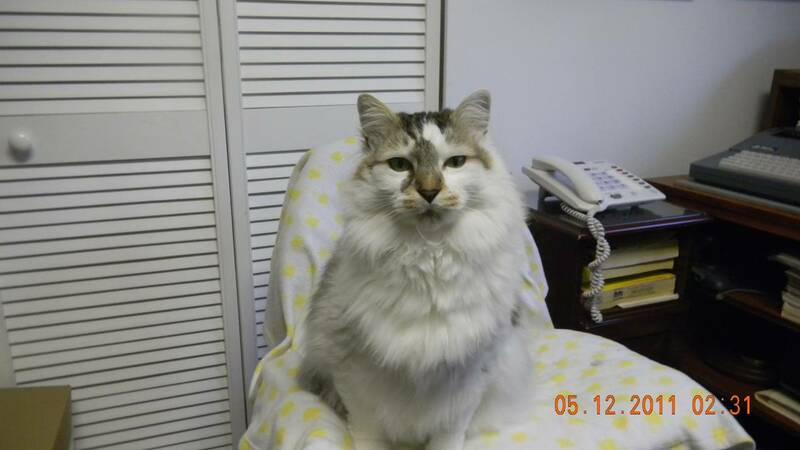 I explained “Sammy” was at our home for some time now, not going home and would she like me to bring home. I was met with a rather indignant and indifferent uncaring glance and told, “it’s a Cat and will come home if its wants to” (or words to this effect). So often typical of many Guardians who should never have a Pet so I returned home. 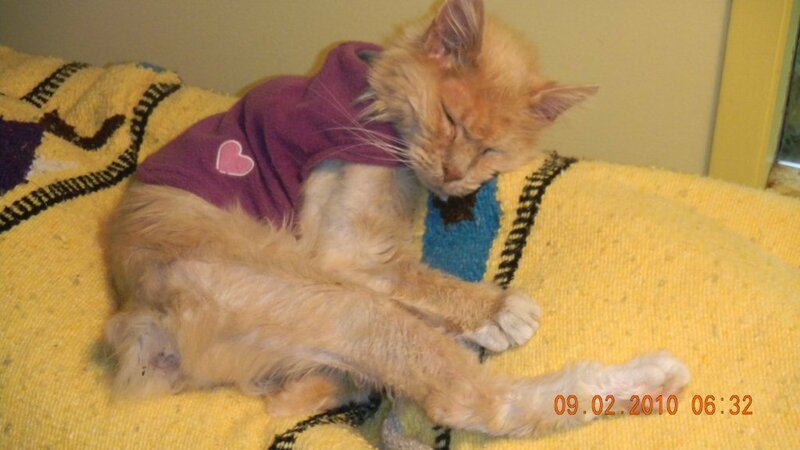 As time passed Sammy remained, started to come indoors and as the Guardian cared less we decided to foster and as days, weeks months turned into a year, we adopted and Sam remained an indoor Cat until his dying day. 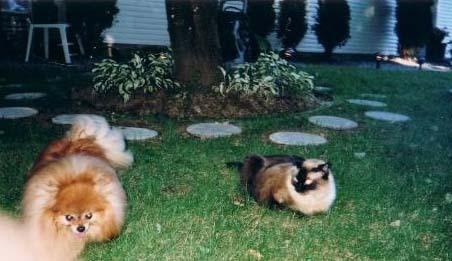 During this time we introduced Sammy to Dr. VJ, commenced medical exams and he soon became a loved member of our home. Sammy, like many Cats, tended to blend in, liked to play, lie around and enjoy his loving family, good food and warm shelter. He had a slight “wild” streak, I imagine from being outdoors and not ever enjoying the warmth of family. 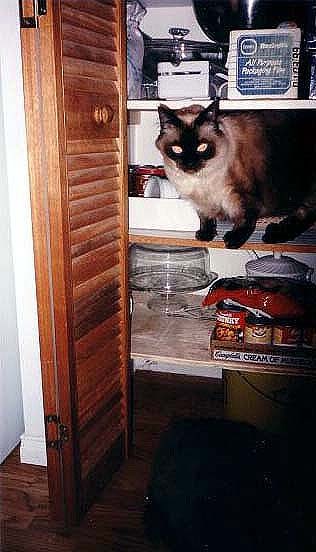 One night I felt a Cat against my foot, thinking it might be Bogey or another who would sometimes come to bed, but to my surprise as I reached down, in the dark, to pat the Cat, I got bitten – it was Sammy and presumably I “spooked him and he reacted”. Well, as it turned out, I visited Emergency Ward at Mission memorial for a three day series of anti-biotic treatment. But I did learn to not pat what I can’t see. Sammy developed an interest in a particular round bed Claudia purchased and each night he would serenade all as he walked around and around, kneading the top of the cover with his paws and sang us a meow song. Sammy was never known as being affectionate, but in (his) last months he started to come up on the chesterfield beside me, or place his paws on my mid-section and want to be patted and cuddled, which I gladly offered. 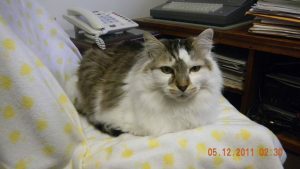 When he suddenly turned ill, it too, was quick and he started to lose bladder control, sometimes wetting the bed or carpet, if he couldn’t get to the litter box. We suspected “Kidney disease” which sadly is too common in older Cats and it can move slowly or progress very fast. Sadly, within a few days Sammy was not doing well at all. We consulted with Dr. VJ and it was decided euthanasia was the course of action to best ensure Sammy did not suffer, so with heavy hearts and immense sadness we made a trip to the Hospital. Standing with Sammy, or any loved Pet, patting him and trying to comfort him is a bed-side manner that all loved family members deserve in their last minutes. It is painful to observe the VET giving an injection to sedate, which sometimes is smooth going, but with Bogey, the poor Cat lost his bowel movement and soiled himself, it can vary. We observe Sammy lying peaceful almost like sleeping, then the second injection, the fatal dose and the tears start, as life quickly ebbs away and a dead family member is lying in your arms. We always select cremation, albeit expensive but ashes are returned in a small urn, that we can keep in a treasured place of memory for our lost family members, over the many years. I have devoted a section in our web.site www.thecouncilclaw.ca to “In Loving Memory” and I am writing an In Memoriam and posting a picture of family members who have passed on. Sadly, not wishing to think of this sad occasion I had been neglectful to take a picture of all Cats but that is changing as I start a Cat Album online. Rest in Peace Sammy, you were a great pal and loved family member, you will be missed. My prayer for all is one day that all Humans develop a compassionate and unequivocal love of our Family Pets, treat with loving care and respect, “they are not just Animals as some heartless people claim”. When I observe the endless stream of stray and unwanted Cats over the years and just as bad today, that some so-called Owner has neglected or been negligent in the needed care, that Cats are left outdoors, as with many Dogs, to freeze in the cold or near die in the heat, to be the dinner of many Coyotes or other wild creatures, it just boggles my mind how insensitive and cruel human may be. That, as we mourn Sammy, our prayer is other Guardians or potential Guardians all do their part to bring a loving pet into their lives. 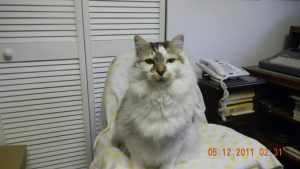 TOBY finally lost his battle with Kidney disease but he was a fighter til the end. 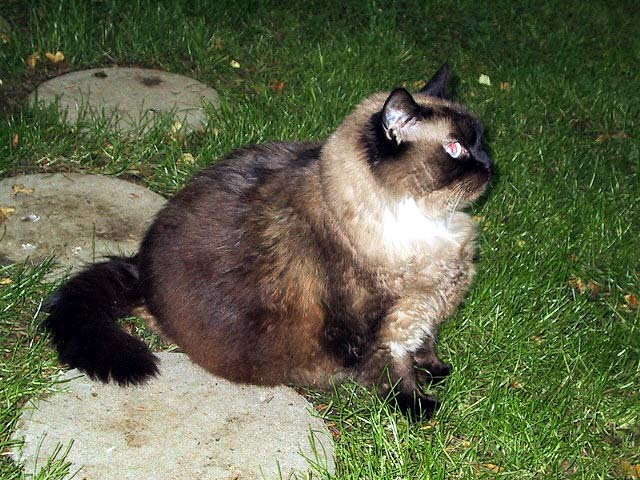 He was always a smaller build but in his last weeks he had lost considerable weight and was mostly “skin and bones”. But he still ventured out to our pond area, jumped up on his favourite bench I had restored and into his little box to catch a few winks during the day. Unsure of his actual age, as he was one of many strays we have adopted since 1995. On a cold winter day, wind blowing and cold, a slight meow was heard in our parking area. Venturing out to look, my wife Claudia saw this little shivering guy curled up in a large flower pot. Gently picking him up and bringing in to our house we got him warmed up, fed and comfortable. He stayed with us til the end on Tuesday August 1, 2017. TOBY was one of those cats who seemed prone to catching colds, then he developed a chronic congestion and cough which we treated under the caring guidance of our VET “VJ” of Clearbrook Animal Hospital. He also suffered from thyroid problem and had to take two pills daily, administered by Claudia but he was a good patient. TOBY bunked in our heated garage with his pal WILLY and after a rocky start, they became pals. Routine every night, we would call them upon darkness and the two would enter the garage, go to their bed and TOBY would get ready for his pills. 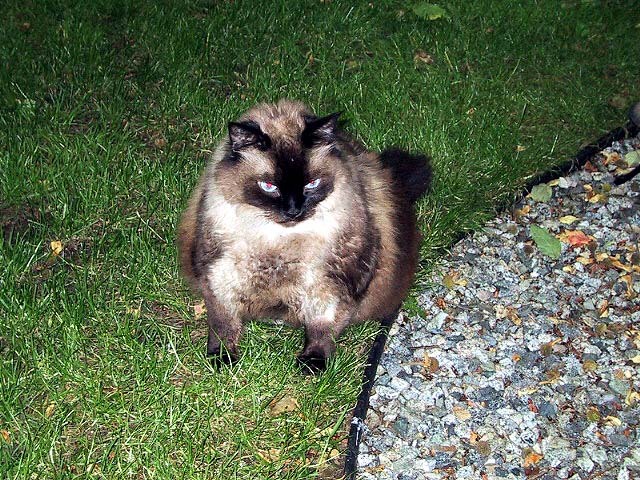 A favourite time was, TOBY and I would sit on a chair in our pond area, I would call him and he would jump up on my lap for some pats. It was clear he never had a nice family life and loving Guardians until he arrived at our home and he was going to make the most of it by being an ideal pet and show all the love he had every day. We came to love TOBY very much and like so many of our family members it was a sad moment when we felt it was time to visit “VJ” and end any suffering. As is our custom, we had TOBY cremated and we will place his urn with all the others on our In Memoriam shelf, which sadly is getting quite full over these many years but each holds years of fun and love from a great many wonderful little family members who only wanted some love returned to match the immense love they gave to us unequivocally. REST IN PEACE TOBY, you will be forever remembered. I awakened today to a home full of sadness and immense feeling of loss, as the first time in over nineteen years our beloved “Crokey” was not on the bed to say good morning and join us for coffee. 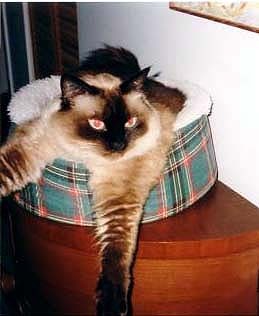 Crocus was one of those “special and unique personality” Cats that is very rare, gaining him the nickname “The Ambassador”. When company arrive other Cats, except the late Smoochy, would seek safe places to hide-out until guests left, but not Crocus. He would answer the door and welcome anyone to his home. It didn’t stop with guests and often when a Tradesperson came to make repairs or an installation, Crocus would be ever present. I recall one day the Electrician was installing a kitchen ceiling light fixture and I heard him laugh. Venturing in to investigate, there was Crocus climbing up the ladder to give him a hand. Crocus and siblings Tubits who remained living with us, Odie who joined our daughter Erna in Lethbridge and two unnamed who were adopted locally, were rescued as babies. From day one Crocus was the (leader), the first to jump off the bed placed on a chair and wander, with others behind him, to see what was going on in his new home and what’s to eat. That was the role in his long life, as organizer and ambassador to beloved family member. Crocus had a habit that at bedtime he would grab his favourite ball, not a store bought plush or such but instead a masking tape ball Claudia had made for him. He would dig though the toy box, find his ball and carry it in his mouth for maybe 10 minutes nightly, walking down the hallway making a croaking sound, hence the other nickname “Crokey”. Kinda annoying when trying to sleep but it was his routine and soon it became ours. Far too many memorable moments to comment upon, as that was Crocus, a wonderful little friend who captured our hearts and minds at such a loving and personality and unequivocal love he displayed daily until the very end. During the last months Crocus was losing considerable weight and was diagnosed as being in kidney failure, a far too common illness we have endured among many of our family. He was down to low weight and getting very boney and fragile, that sadly we understand the end was nearing. Another clear sign is we find family pets declining in health seek a further closeness and this often translates to wanting to sit on our chest and cuddle close more. It is hard to accept the end is nearing and on the fateful day to say, witnessing declining health and now small cries of pain and growing discomfort, to visit the Veterinarian. 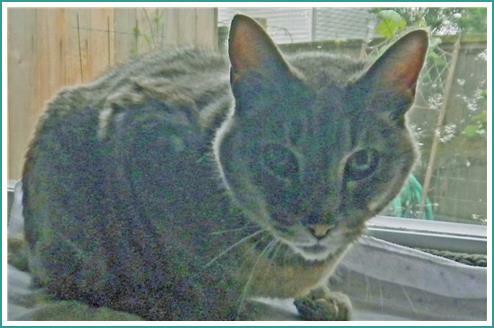 I phoned our Vet Dr. Vishesh Jalan, DVM (Dr VJ) of Clearbrook Animal Hospital in Abbotsford but he was on his time off. The Receptionist phoned him at home and “VJ” graciously arranged to come in to be with us and attend to Crocus. Sadly, in memory, we have a growing number of small urns on a shelf that serve as reminders of so many wonderful pets who have shared our lives. It is also reassuring to have such a kind and compassion Vet who shares our lives and is there for the health of our cherished pets, that he is there for us in our important time of need, to as with “VJ” to come in on a day off knowing the importance of doing so. To those with compassion and understanding of feelings and an unequivocal love will empathize with our sadness and grief and realize beyond the insensitive overture of those who lack such understanding/compassion and simply say, “it’s only a cat” but unfortunately, human emotions are expressed indiscriminately and from a sense within, whether the loss of a parent, child, loved one or yes, a family pet, it is the same emotions. Hence, the feelings we share about the loss of Crocus, the tears we shed, the wonderful memories and the important role he played in our lives will live on in our memories forever. We know Crocus will be soon taking a leadership role in “Cat Heaven” and we are blessed to have know him for so many years, that his loss will create a massive vacuum in our daily lives which he was very much a significant part of. Rest in peace Crocus.